Walter Shaub, who prodded President Donald Trump’s administration over conflicts of interest, resigned July 19. When presidential adviser Kellyanne Conway urged “Fox & Friends” viewers Feb. 9 to “go buy Ivanka’s stuff,” the move generated 1,610 pages of public comments to the Office of Government Ethics. The ethics office’s chief counsel jumped into action, opening a back-channel negotiation with his counterpart at the White House over how to handle the apparent ethical breach. Federal rules prohibit using public office for private benefit, such as promoting the president’s daughter’s line of jewelry on TV. But the deal didn’t involve significant punishment for Conway, who said President Donald Trump “supports me 100 percent” on the matter. Instead, ethics office counsel David Apol and the Trump administration’s ethics lawyer agreed to engage in a Kabuki theater aimed at compensating for the office’s inability to make Conway face repercussions for her ethical violation. The Office of Government Ethics did not have the power to punish Conway directly, and could only make a public display of attempting to shame her boss into action. The negotiations are revealed in emails that have been stored on an ethics office documents repository. They’re newly relevant following a New York Times report this week suggesting that, by appointing Apol acting director of the Office of Government Ethics, Trump named a pushover to replace hard-nosed Walter Shaub, who resigned July 19. But the reality behind the scenes was more nuanced, the emails show. Taking a conciliatory stance on ethics issues seems to have been Apol’s assigned role under Shaub. As members of the Trump administration committed repeated ethical violations, and it became clear the Office of Government Ethics did not have the authority to stop them, Apol and his boss cooperated in a good-cop, bad-cop routine meant for public consumption. Shaub issued fiery statements, while relying on Apol to smooth out relations with the White House behind the scenes. During the weeks before and after Trump’s Nov. 8 election, Apol had traded articles with colleagues commenting on the fact that the ethics office would have limited authority to curb presidential ethics violations. When it became clear the morning of Feb. 9 that Trump would not punish Conway for her remarks, Apol spoke with Stefan Passantino, the White House lawyer handling ethics issues for Trump. Over the course of two telephone conversations, the men agreed that the Ethics Office needed to at the very least make a public show of responding to Conway’s breach and Trump’s complicity. “In light of the attention this issue has drawn and the volume of calls OGE is receiving, we discussed that OGE will need to be able to reassure the public that we are addressing this issue with you. You stated that you understood and did not want to interfere,” Apol wrote in a 11:40 a.m. email to Passantino. Passantino for his part purportedly said he would take “appropriate action,” according to Apol’s email. Shaub on Feb. 13 sent a heads-up email to Passantino “as a follow-up to Stefan’s conversation on Thursday.” Shaub attached a letter to be sent by U.S. mail to Passantino and also released publicly. In the end, the White House didn’t discipline Conway, a decision Shaub admonished in another public letter. Senate Republicans this week shrugged off the ethical concerns swirling around lobbyist David Bernhardt, Trump’s nominee for a top environmental post. 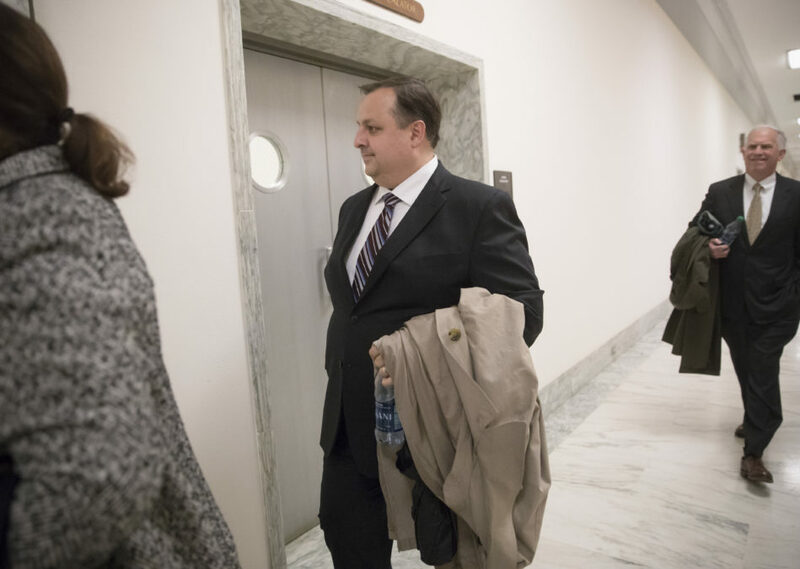 They voted in a bloc to confirm Bernhardt, whom green groups had dubbed “a walking conflict of interest” because of his lobbying work for oil companies, mine operators and agribusiness concerns. He will be responsible for regulating those industries in his new job as deputy secretary of the Department of the Interior. Two good-government groups had sought an ethics probe of Bernhardt, and Democrats had played the conflict-of-interest card in an effort to turn his nomination back. But four Democrats joined the GOP in giving Bernhardt the green light. The final vote was 53 to 43. Three of the Democrats who voted for Bernhardt are lawmakers from conservative states where the energy industry has clout. Sen. Heidi Heitkamp, who is sometimes called “North Dakota’s last Democrat,” is a big supporter of the controversial Keystone XL pipeline. Sen. Joe Manchin’s home state of West Virginia is coal country. It’s a similar story for Indiana Sen. Joe Donnelly, another moderate Democrat in a red state where the coal industry is in decline. The fourth Democrat, Colorado Sen. Michael Bennet, appeared to vote for Bernhardt because the lobbyist hails from Colorado. The only pro-Bernhardt Democrat who commented on his vote, Bennet put out a statement saying he expected Bernhardt not to undercut Colorado’s efforts to reduce methane gas pollution from natural gas operations. The environmental group Conservation Colorado said it was disappointed in Bennet’s vote. One Democrat who might have wavered wound up voting against Bernhardt. Sen. Dianne Feinstein of California is close to the state’s agriculture interests, and has attended events in the Central Valley sponsored by the powerful Westlands Water District, Bernhardt’s biggest lobbying client. Last year, she and Rep. Kevin McCarthy, a Bakersfield Republican, inserted language in a major California water bill that had been sought by Westlands. As Reveal from The Center for Investigative Reporting has reported, Bernhardt helped Westlands write technical language for the bill. But for years, Feinstein has battled to stop Los Angeles-based Cadiz Corp. from draining an aquifer under the Mojave Desert and piping the water to L.A. In May, she urged Secretary of the Interior Ryan Zinke to stop the project, saying it would destroy the desert. Cadiz is yet another client of Brownstein Hyatt Farber Schreck LLP, Bernhardt’s lobbying firm. If the administrator loses interest, is that a conflict? When he was Oklahoma’s attorney general, Scott Pruitt’s legal attacks on the U.S. Environmental Protection Agency made him a darling of the energy industry – and a magnet for its campaign cash. A climate-change skeptic, Pruitt sued the EPA 14 different times to blunt regulation of oil and coal. And so, when President Trump appointed Pruitt to lead the EPA, an era of disruption seemed at hand. Nobody predicted Pruitt would skip out on work. But according to EPA records released this week by the nonprofit Environmental Integrity Project, from March through May, Pruitt spent 43 out of 92 days not at his Washington, D.C., office, but back home in Oklahoma – or traveling to get there. On five other days, he also was on the road, in Colorado, Arizona and Texas. The records lack detail, so most of Pruitt’s time in Oklahoma isn’t accounted for. But the records show he met with an oil drillers group, toured a chemical plant and gave a speech to the American Legislative Exchange Council, which drafts industry-friendly legislation. Pruitt charged taxpayers $12,000 for his airfare; the project didn’t learn the cost of airfare and lodging for his staff and the 10 security guards who usually accompany him. The New York Times’ report on Pruitt’s travels speculated that he is thinking of going back to Oklahoma to run for office. As Reveal reported earlier this month, Pruitt in recent years set up two federal political action committees and raised more than $800,000, with significant money coming from energy concerns. There’s no U.S. Senate seat up for grabs in Oklahoma until 2020, when 82-year-old Sen. James Inhofe’s term expires. White House chief strategist Steve Bannon uses a personal spokeswoman who is volunteering for the job, and is not formally employed by the government. This, said experts interviewed the Center for Public Integrity’s Christina Wilkie, may violate a law saying government employees can’t accept voluntary services for the government. The story grew out of #CitizenSleuth, a project launched by the Center for Public Integrity and Reveal. Long-time Republican flack Alexandra Preate says she serves as Bannon’s “personal spokesperson,” while also volunteering to help other White House officials with press matters. Violating the law is a felony, Wilkie reports, but nobody has ever been prosecuted under the Antideficiency Act. Bannon “took an oath to support and defend the Constitution,” (Kathleen Clark, a law professor at Washington University in St. Louis and an expert in government ethics) said. Meanwhile, in what the Washington Post said was his 39th attempt to get it right, presidential son-in-law and adviser Jared Kushner last week disclosed 70 more holdings that had been left off his earlier ethics filings. Among the assets detailed in the new filing: his investment in an online real estate trading service valued at $800 million. The Post said it’s not unusual for appointees to have to revise their ethics filings, especially if their finances are complicated. Since joining the White House staff, Kushner also has updated a national security questionnaire he was required to file: Initially, he failed to disclose “more than 100 calls or meetings with representatives from foreign countries,” the Post reported. Matt Smith can be reached at msmith@revealnews.org, and Lance Williams can be reached at lwilliams@revealnews.org. Follow them on Twitter:@SFMattSmith and @LanceWCIR.